Verna cars are dependable and add immeasurably to your lifestyle. You care for your car but do you do enough? A casual wipe with a rag is not going to put the shine back into the exteriors of your Verna. Nor will a waxing and polishing. What your conveyance needs are a professional coating. Come to Motorcoats, we will give you the touch that puts your car above the ordinary into a special class. 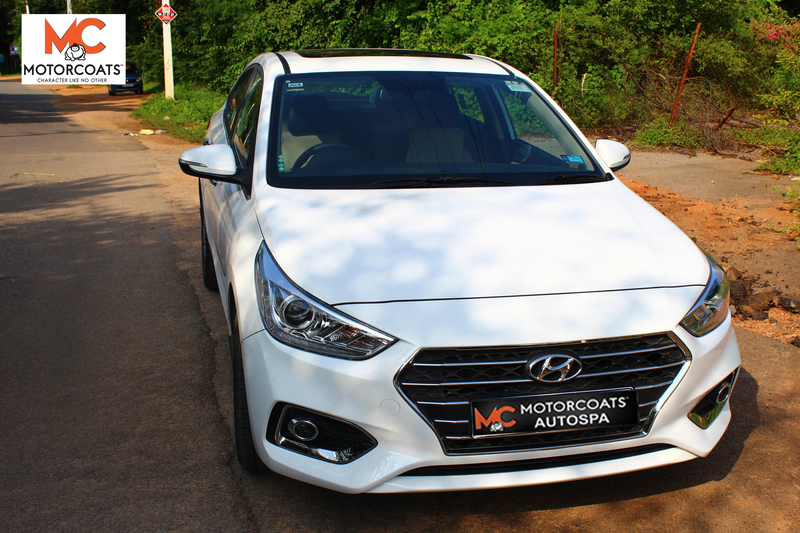 Get our Verna car coating service to give that special glow your vehicle needs. We use company recommended products for your car. Using Japan technology, we give you a glass and ceramic coating options for your vehicle. This coating material is a watery substance that binds to your car paint and lasts for six to seven months per application. Now, compare that to an ordinary wax application that lasts barely for a month! Applying wax often can make a car look dull because wax destroys paint over time. Before you apply our car coating, let us do your exteriors. Doing Verna car detailing service involves washing and removing grime and dirt sticking to the outsides of your car. For this, we clean tires and window exteriors. We use detergent to make everything sparkle. Next, we vacuum and disinfect interiors. We use detergents to clean the floor mats, shampoo the mat, and clean the boot. Cleaning interiors remove bad odours and bacteria left behind. It is recommended that you do car detailing for your Verna once in 3-4 months at least.